Environment Domain Aliases will replace the default domain of all Functions in your environment. 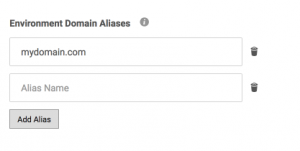 Once the Domain Alias is set up, you will be able to use your own custom domain in order to trigger your Functions. With this, go to a DNS record setter and point your domain to this URL. Next, you will need to set the alias in your Spotinst environment. This does not need to be done within a function and can be set any way you are most comfortable.